This majestic Birkhaven Sleigh Bed by Pulaski Furniture features a button tufted leather headbord, pierced metal reinforced decor and framed panels accented with highlights of gold and silver. 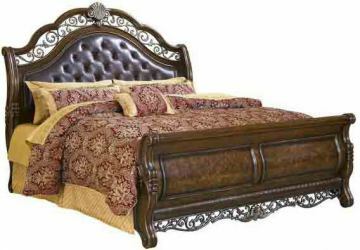 The Birkhaven Collection is reminiscent of old world European grandeur. The bombe curves, figured burl, antiqued hardware and lavish metal scrollwork in this collection hearken back to an age of baroque opulence.